TUESDAY JANUARY 5 (Scranton, PA) – Five Vikings scored in double figures, and freshman Joe Zayer (West Nyack, NY/Clarkstown South HS) notched a double-double, but the Westchester Community College Men’s Basketball team opened 2019 with a 103-94 loss to Lackawanna College on Saturday in Scranton, Pennsylvania. With their second consecutive loss, the Vikings are now 8-5. It was a battle for much of the game as both teams shot incredibly well during the first half. Lackawanna led 53-51 at halftime as the Falcons shot 59% from the floor, while the Vikings converted 48% of their field goal attempts. However, over the final 20 minutes, Westchester cooled off, allowing the hosts to pull away for good. Lackawanna led by as many as 18 points during the second half before a late Westchester rally made things closer. Sophomore Miles Haughton (Mamaroneck, NY/Mamaroneck HS) led Westchester with 25 points, while sophomore Maurice Hollis (Bronx, NY/Tuckahoe HS) continued his recent stretch of fantastic play with 16 points. Nathan Emanuel (Suffern, NY/Suffern HS) added 11 points, while Fabian Johnson (New York, NY/Our Savior Lutheran) had 10. Zayer chipped in 13 points and 10 assists. Shooting efficiency proved to be the difference as Lackawanna shot 54% from the floor, while the Vikings ended the game shooting 42%. The Falcons out-rebounded Westchester 38-36, while the Vikings forced 28 Lackawanna turnovers, while committing only 17. JANUARY 8 (Bronx, NY) – Freshman Fabian Johnson (New York, NY/Our Savior Lutheran) scored nine of his 13 points during the second half of play and added nine rebounds and four blocked shots. Devan Lawson (Spring Valley, NY/Spring Valley HS) turned in his best effort of the season, scoring eight of his 12 points over the final 20 minutes as the Westchester Community College Men’s Basketball team opened 2019 with a 74-71 win over Bronx Community College on Tuesday night at Bronx CC. With the win, the Vikings are now 9-5 during the 2018-19 season. It was a tale of two halves for the Vikings as Bronx (4-10) got off to a fast start, and seemed to be in command with a 39-27 lead at halftime. However, during the second half, the Vikings stormed back, outscoring the Broncos 47-32 over the final 20 minutes to break a two-game losing streak. Four Vikings scored in double figures as Nathan Emanuel (Suffern, NY/Suffern HS) had 10 points and eight rebounds, and Joe Zayer (West Nyack, NY/Clarkstown South HS) scored a team-high 15 points, and added six assists and five rebounds. Westchester shot 43% from the floor – compared to Bronx’s 41%, and held a 47-45 rebounding edge. JANUARY 10 (Paterson, NJ) – Another tight game, another second half rally, and the Westchester Community College Men’s Basketball team may have unleashed a brand-new weapon as the home stretch of the 2018-19 season begins. Led by a career-high 19 points for sophomore Jon Brennan (Irvington, NY/Iona Prep), including 17 during the second half, the Vikings won for the second straight game, 92-86 over Passaic County Community College on Thursday night at Passaic. With the win, Westchester is now 10-5 for the 2018-19 season. 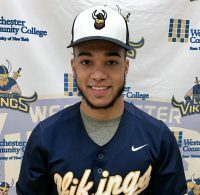 As they did during a win over Bronx Community College on Tuesday night, the Vikings could not quite find a rhythm on Thursday, struggling particularly on the offensive end. At halftime, the hosts held a 40-39 lead. However, like they did at Bronx CC only 48 hours earlier, Westchester exploded during the second half, scoring 53 points, as Brennan connected for four three-pointers during the final 20 minutes. Also for WCC, freshman Joe Zayer (West Nyack, NY/Clarkstown South HS) netted a team-high 22 points, while sophomore Monte Lambert (Brooklyn, NY/James Madison HS) scored 16. The Vikings also enjoyed another fine effort by Devan Lawson (Spring Valley, NY/Spring Valley HS) who chipped in 10 points, while sophomore Miles Haughton (Mamaroneck, NY/Mamaroneck HS) scored 11 points. SUNDAY JANUARY 13 (Fairfield, CT) – Sophomore Matthew Rice (Lagrangeville, NY/Arlington HS) and freshman Matthew Rush (Valhalla, NY/Valhalla HS) finished in the top-10 individually as the Westchester Community College Men’s Bowling Team opened the 2019 season with a third place finish at the Viking Classic on Sunday, Jan. 13 in Fairfield, Connecticut. Westchester finished the event with 5379 pins, compared to 5512 for Sacred Heart University and 5917 for event champion Suffolk Community College. Rice averaged a 167.3 over six games to finish fifth individually, and secure a spot on the All-Tournament Team. He also teamed with freshman Edward Aiken (Middletown, NY/Pine Bush HS) to finish fifth in doubles competition with a 956. Rice’s best performance came during the sixth game, when he bowled a 184. Rush, competing at the collegiate level for the first time, earned a ninth-place finish with a 155.8 per-game average. He started the competition quickly, averaging more than 168 pins per game during the first four games to challenge for a top-three finish, but dropped off a bit late. However, his fast start bodes well for the team as the season progresses. Rush also teamed with sophomore Anthony Mignone (Scarsdale, NY/John Jay HS) to finish sixth in doubles competition with a 936. Mignone finished 12th in singles competition with a 149.7 average, only 32 pins behind a top-10 finish. With a strong showing to start the season under their belt, Westchester returns to action on Saturday, Jan. 19 when the Vikings travel to the Blue and Gold Classic at Spins Bowl in Carmel, NY.